Update: Each purchase now comes with a funky tote bag at Kinokuniya Singapore and major bookstores in Southeast Asia. 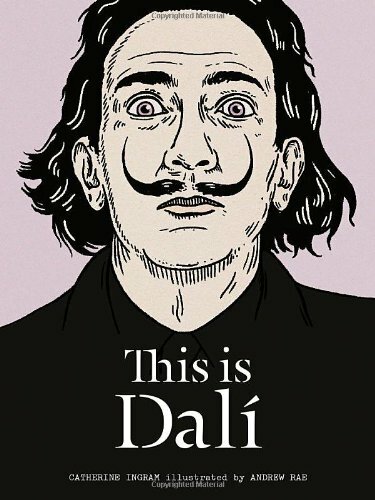 This is Dali is a book that looks at the life of famous Surrealist painter Salvador Dalí. It's authored by Catherine Ingram with illustrations by Andrew Rae. It's a picture book. This is one of the several picture books in the artist focused series by publisher Laurence King Publishing. There are also Warhol and Pollock. The writing is light and casual, looks at the history of Dali as he became the flamboyant artist we know, and also shows us his lavish lifestyle. I only know Dali for his Surrealist work but there are also many other very accomplished paintings included in the book. The illustrations are also interesting and highlights the eccentricities of the painter. Dali is an artist who is not afraid to call attention to himself. In fact, he loves attention and adoration. His many antics are collected in the book. This is a nice introduction to Dali. It's meant for entertaining light reading and is not a full biography. There are 80 pages including several pages of illustrations. Every purchase comes with a free funky tote bag that's available at Kinokuniya Singapore and bookstores in Southeast Asia.